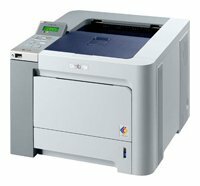 Brother HL-4050 - this color network printer with integrated duplex printing. This printer uses four colour laser beam printing up to a speed of up to 20 pages per minute. Maximum printing format A4, and is 210 x 297 mm, Has good resolution printing 2400 x 600 dpi. Also the printer has an LCD display, which significantly simplifies the work on it. A high-quality system of the duplex allows to use it both at home and in any office. Another printer, connect to a network via Ethernet.